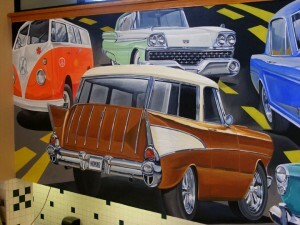 August 4th – “Classic Road Show” Mural is Complete! With only three days of drawing and thirteen days of painting the newest mural on Route 66 is complete!. 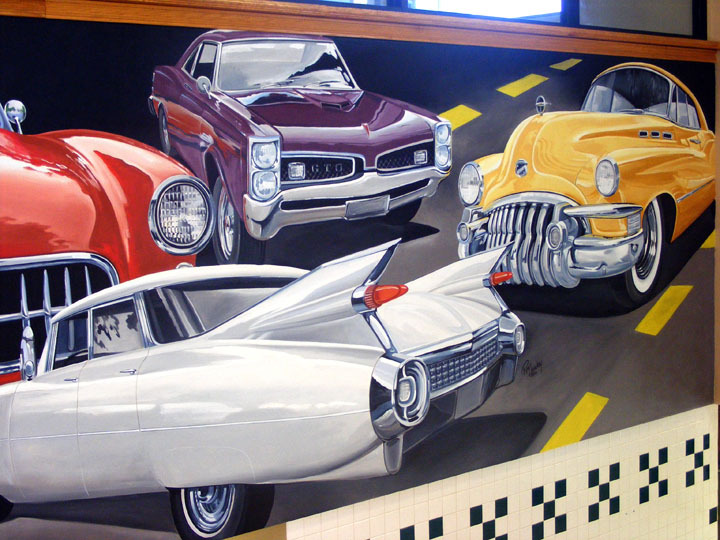 The mural titled “Classic Road Show” commissioned by Midwest petroleum was signed by artist Ray Harvey yesterday after the last brush stroke was applied. 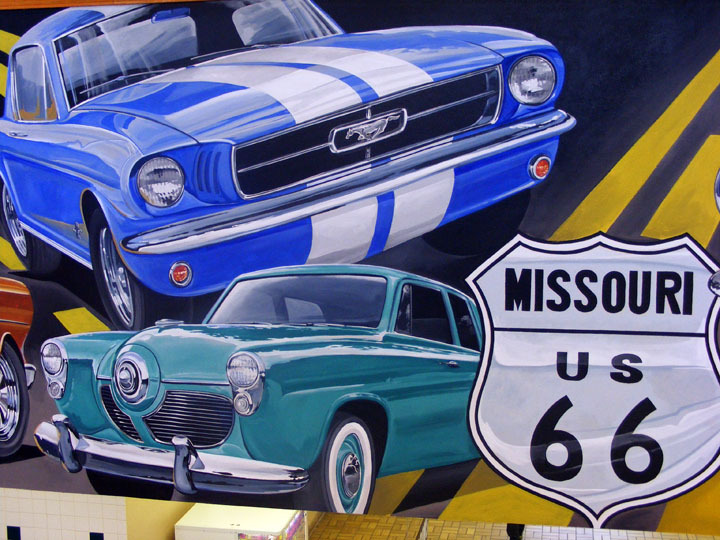 The painting measuring 50′ wide and 8′ tall is located in the Midwest travel plaza at the corner of Route 19 and Interstate 44 in Cuba, MO. This painting marks the twenty-second original art piece by Ray Harvey in the area. The mural depicts a few of the classic cars seen on Route 66 during it’s hey day. The mural will greet the thousands of travelers and local patrons stopping in for food, fuel and refreshments. The plaza serves customers on nationwide travel as well as campers, truckers, residents and visitors to the Lake of the Ozarks. Ray Harvey’s next mural is scheduled to begin next week at the Overstreet House of Cars in Maryland Heights, MO. This is the newest classic car museum in the midwest and will house at least one Ray Harvey original. This one being a Drive-In scene from 1969. 3 Responses to August 4th – “Classic Road Show” Mural is Complete! Thanks for adding more beautification to Cuba. We will be adding this to our link Other Public art at cubamomurals.com. Thank you for the compliment. Sorry for such a long delay in responding.